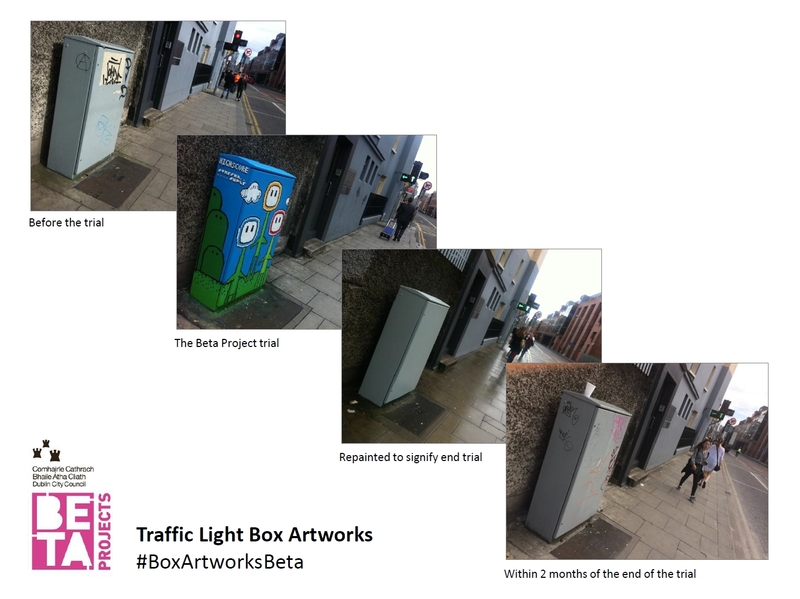 What was the outcome of the Traffic Light Box Artworks Beta Project? Please use the hashtag #BoxArtworksBeta on social media to help us and everyone else follow the conversation. Click on the below image to see the full Report Card. Click on the below image to see a summary Report Card (with interpretation). This solution is now available to be rolled out on up to 200 traffic light boxes – across all areas of Dublin City. Enable communities to have greater say about their area. Allow for local tweaking of the solution to better suit individual areas of the city. Checking that the idea still works at larger scale. Would you like to paint a box? If you’re interested in being kept up to date with any further news on this, or painting a box at some stage, you can register your details here! This entry was posted in 2. Environmental, 3. Moving About, Beta Project macro, Shane, Street Art and tagged report card, street art. Bookmark the permalink.